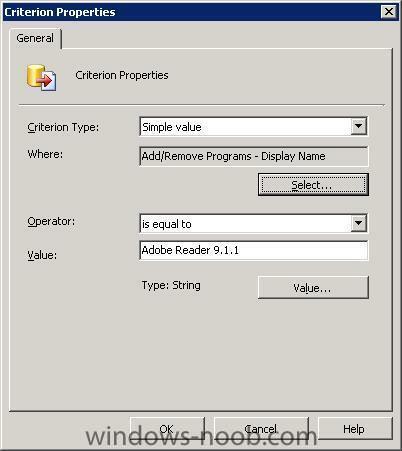 I created collection to show me all clients that HAVE NOT Adobe Reader 9.1.1 in the Add/Remove Programs as the attached document. I search by product id and display name but the result not accurate, I found some clients in the collection have Adobe Reader 9.1.1, I don't know why?? so please is there are anybody here have idea how to solve that issue. select SYS.ResourceID,SYS.ResourceType,SYS.Name,SYS.SMSUniqueIdentifier,SYS.ResourceDomainORWorkgroup,SYS.Client from SMS_R_System as sys where sys.ResourceId not in (SELECT ARP.ResourceID FROM SMS_G_System_ADD_REMOVE_PROGRAMS AS ARP WHERE ARP.DisplayName = "Adobe Reader 8.1.3" AND ARP.Version = "8.1.3") and sys.SystemGroupName = "sccm2007\\Adobe Reader Users"